This research is dedicated to studying longterm estuarine morphodynamic behavior under combined river and tidal forcing. 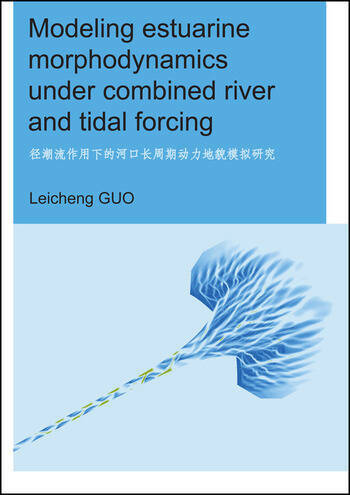 Analysis of river tides in the Yangtze River estuary (YRE) in China, schematized morphodynamic modeling in 1D and 2D mode and morphodynamic modeling of the YRE based on a process-based numerical model (Delft3D) are conducted. Morphodynamic sensitivities to river discharge magnitude and time variations, tidal strength and tidal constituents are then systematically explored. Analysis of river tides in the YRE reveals strong river-tide interactions and non-linear modulation of tides by river discharge. River discharge alters tidal asymmetries and resultant tidal residual sediment transport. Analysis of morphodynamic modeling results exposes significant mechanisms inducing tidal residual sediment transport and controlling long-term morphodynamic development. Morphodynamic equilibria in 1D and 2D simulations can be defined by vanishing gradients of tidal residual sediment transports and meeting empirical morphodynamic relationships. This research indicates the value of numerical modeling in examining long-term morphodynamic development in millennia time scale. Understanding of the controls on morphodynamic behavior in estuaries under river and tidal forcing is to the benefit of managing estuaries’ functions in a long-term point of view. 3.4.3. How important is friction to tidal dynamics?